You’re never at more danger than when you’re in a trench. Unstable soil could collapse at any time – causing a much higher risk of fatality than other excavation work. That’s why Felco is proud to manufacture trench shoring boxes right here in Montana. Quick lead times, and the lowest shipping costs in the Northwestern US and the Southern Prairies in Canada. 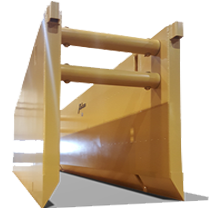 Felco trench boxes are designed, and certified by professional engineers to meet or exceed OSHA standards.